Bhaktivedanta Manor is the UK headquarters of the International Society for Krishna Consciousness. With the very kind contribution of late George Harrison, the Temple was established in 1973 by our movement’s founder Srila Prabhupada. Today the Manor is renowned as one of the largest and most dynamic temples in Europe. Each year over two hundred thousand pilgrims and guests pass through our gates, immersing themselves in philosophy and culture, and enjoying the rural beauty of the estate. From ox-cart rides to yoga retreats, a full spectrum of activities engages the whole family in an enlivening and enriching experience. The wedding (vivahas) is one of most important religious events (samskaras) in one’s life. Bhaktivedanta Manor with its beautiful and spacious building and grounds is home to presiding deities Sri Sri Radha Gokulananda and Lord Krishna’s home is a wonderful setting for your memorable occasion. Bhaktivedanta Manor has been successfully conducting wedding ceremonies since 1973. 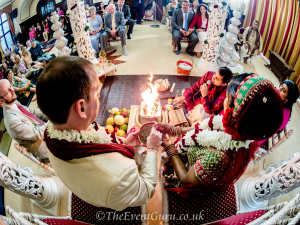 The convenience of combining your religious and civil ceremony at Bhaktivedanta manor allows you to focus on your special day without the anxiety of having to manage it also. It is our utmost pleasure to be able serve you.